There is gear that looks good. There is gear that works perfectly. And then there is gear that gets you engaged…and then keeps you dry when, immediately after she says “yes,” you tomahawk mid-line and dislocate your shoulder. The Patagonia Untracked outerwear kit is that kind of gear. Okay, there were probably personal factors that influenced my fiancé’s answer when I proposed on Rogers Pass, BC this past winter. But, to be egotistical, I looked good in my Untracked setup, and I figured that probably helped. If nothing else, it kept me dry when I tumbled and while she reset my shoulder. I usually re-up with new outerwear each season, but last year I did not. I had gotten my hands on the Patagonia Untracked kit at the start of the previous winter, and by the time I hung it up for the summer it’d already seen 75-ish days, from South Korea to British Columbia, via chairlifts, skins, helis and snowcats. And this past season, I put another 75 more days on the outfit. However, perhaps the most brutal test was my home mountain of Mt. Baker Ski Area, WA. 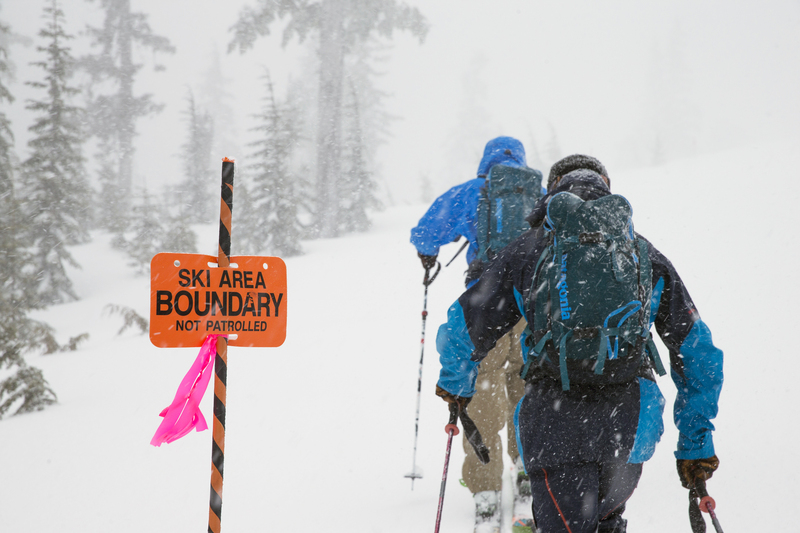 If you’ve ever skied in the PNW during a 33-degree pow day, you’ll understand. It’s truly the crucible for outerwear. And yet, after two winters of unrelenting beating, at the end of the season I was still wearing that kit as my day to day. The Untracked’s burly, three-layer GORE-TEX shell isn’t as light as the more technical Powslayer’s, but I think it contributed to the fabric’s longevity, even after multiple washings. The adjustment cords were still taught, as was the powder skirt and boot gaiters. All the zippers worked, although there was a small kink in the front that made for a little finagling. I am unashamedly style-conscious, and so one standout feature for me was the fit, especially for technical outerwear. The tailored shape and ample length definitely allowed for a fresh look, and the longer legs on the pants meant I was able to size down without straining at the waistband. The articulation and high crotch cut—combined with the large, open vents on both the pant and jacket—meant it worked well for touring, while remaining trendy in the park or for inbounds hot laps. Even the best pieces of equipment have their issues. As mentioned before, the front zipper went wonky towards the end of the second season, but that was reasonable considering the amount of use I’d put on it, and it still worked fine. While the larger fit of the pants was great for a trendier look, my mountaineering/backcountry-oriented friends found they had to size down significantly to avoid it interfering with longer tours or technical hiking. And I know the one-button, minimalist powder skirt cuts weight, but to me it felt flimsy and wasn’t the best for keeping snow out on deep days. That said, my kit is two years’ old, and while the majority of the jacket and pants’ design have stayed the same, Patagonia has fixed a few of these problems in the newer versions. The fit has been further tailored for better articulation, which hasn’t affected the jacket much but means the pant is better for skinning or climbing. And on a style note, the collar/hood has been redesigned on the new jacket. My one remaining issue is the pow skirt—while there is a loop in the back to connect with the pants, it doesn’t do much to keep the skirt sealed. This could be fixed with the addition of a few more loops, but currently I suggest wearing bibs on storm days. In the end, I can easily say the Untracked jacket and pant is the best outerwear setup I’ve owned. The price is a bit daunting—$599 USD and $449 USD for the jacket and pant, respectively—but well within the range of similar models from other companies. And considering it will last you multiple seasons of heavy use, it’s a completely reasonable deal, and Patagonia’s stellar warranty/repair guarantees it will keep going far longer than that. As with boots, skis and bindings, skiers these days are constantly looking for the quiver-killer of gear. It’s the same with outerwear, and the Untracked will handle whatever the conditions, be they rain, sun or snow…or proposing to your significant other on the top of a mountain, shortly before heading to the emergency room for post-engagement X-rays. To purchase the Untracked jacket and pant or check out official specs and colors, visit Patagonia’s website at www.patagonia.com.